Bioenergy Corridor: Where is willow planted? Blas MOLA-YUDEGO and José Ramón GONZÁLEZ-OLABARRIA. 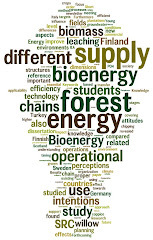 2010 Mapping the expansion and distribution of willow plantations for bioenergy in Sweden: Lessons to be learned about the spread of energy crops Biomass and Bioenergy 34:(4)442-448. The paper analyses the spread of willow cultivation for bioenergy in Sweden, during the period 1986–2005, linked to the changes in the policies of promotion of wood-energy crops and to the local economic framework. To perform the study, a geostatistic method based on kernel analysis is applied, in order to identify the spatial grouping patterns of growers and plantations, and the areas where cultivation was successful. The analysis of the resulting figures shows that the development of an infrastructure and a market for willow chips are essential pre-conditions for the development of short rotation coppice for bioenergy. The results of this study confirm that probably the most important factor in the location of willow plantations is the existence of consumers that can guarantee a long-term demand for willow chips. The tools and methods presented, and its analysis, can provide a better understanding of the interactions between the biomass producers, the energy consumers and the different local and national actors. For citing the figure: Blas MOLA-YUDEGO and José Ramón GONZÁLEZ-OLABARRIA. 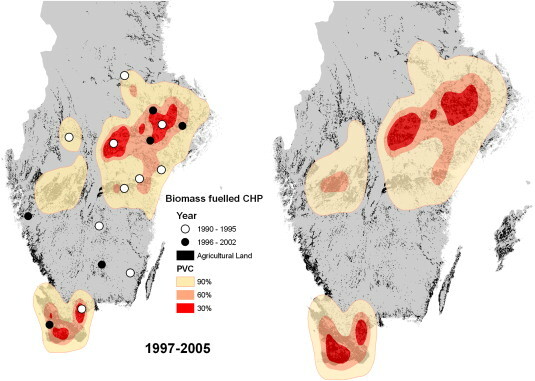 2010 Mapping the expansion and distribution of willow plantations for bioenergy in Sweden: Lessons to be learned about the spread of energy crops Biomass and Bioenergy 34:(4)442-448.